The beauty of stamped concrete is unsurpassed in any setting. This raw beauty is coupled with the longevity and durability that concrete itself offers – making stamped concrete an excellent choice for those wanting to liven up their environment. There really is no limit to what can be done with stamped concrete – virtually anything that can be done with regular concrete. Stamped concrete can be installed as patios, decks, walkways, driveways, and anything else you can dream of! 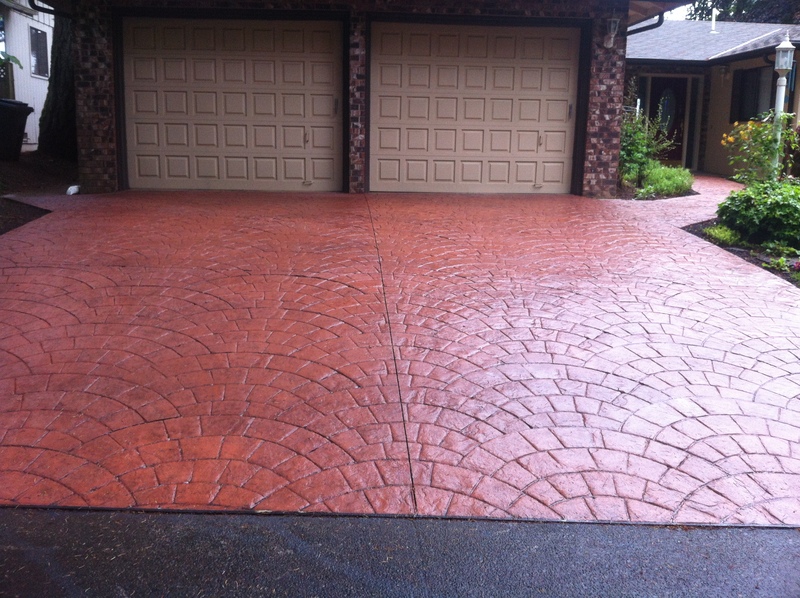 Over 100 patterns of stamped concrete are available and at least that many color choices. Patterns and colors are independent of each other, so feel free to mix and match. Any of the patterns can be trimmed out with one of several border options. E & M Remodeling has worked on a wide range of concrete projects from concrete driveways, side walks, patios, fire pits, RV pads, steps, retaining walls, and foundations. 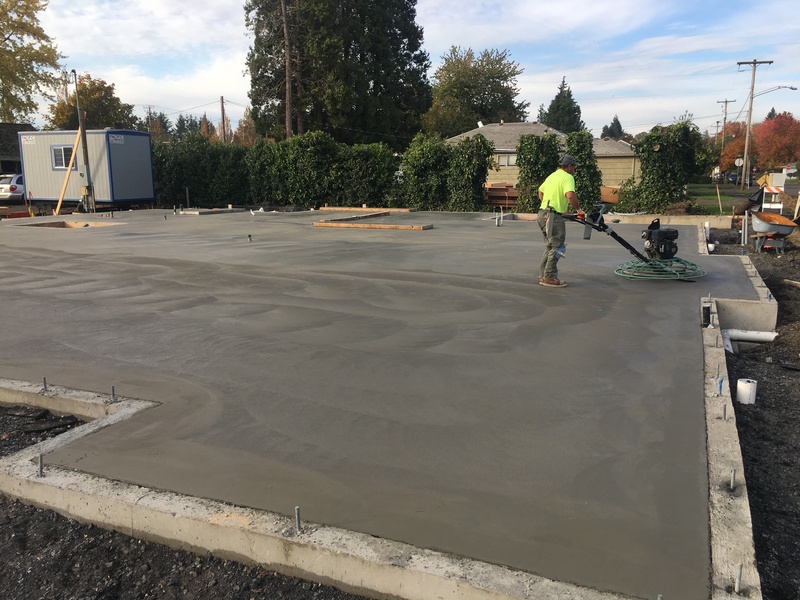 Whether you’ve just discovered the beauty and versatility of stamped concrete, or you’re already familiar with its qualities, Oregon is one of the best locations to see stamped concrete. A variety of textures can be created by stamping or carving patterns into concrete. The patterns and textures can then be colored for subtle, nature-like variations. We use integral color in the concrete so if there you should get any chips throughout the years in your concrete you won’t have a grey spot standing out at you. 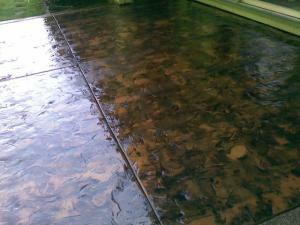 Stamped concrete is an economical way to transform plain, gray surfaces. There are a variety of patterns to choose from such as slate, ashlar stone, cobblestone, and more. Cutting-edge cities such as Salem and Portland often display stamped concrete in public areas such as commercial shopping centers, sidewalks, zoos, etc. Homeowners are also finding the value of stamped concrete can increase their curb appeal. Concrete stamping techniques are often used on concrete driveways, pool decks, patios, and walkways. There are options with the style of stamp that is used to imprint your concrete. Many concrete stamps are beautiful cut-stone patterns like shown in the above picture, i.e. ashlar slate, flagstone, and brick. There is another style of concrete stamps that are seamless, as in stone texture with no grout lines. These concrete stamps are called texture skins and are used to imprint your concrete or overlay with textures of slate, granite, and river rocks. Texture skins produce a flatter, more level pattern that is a little more table and chair friendly, yet just as eye-catching as any of the stamped concrete patterns. The stamped concrete is often cut into large squares to simulate cut stone slabs taken directly from a nearby mountain side. Concrete driveways offer a lot of options. Any style home such as Victorian, bungalow, ranch-style, modern, etc., can be complemented with a colored driveway. There are nearly unlimited choices in colors which makes it easy for matching or integrating a driveway with a home’s design. Concrete stamping allows driveways to be patterned to look like cobblestone or slate with a much more economical price tag than installing real stone. A textured and colored concrete patio can be the unifying theme in creating your backyard oasis. With so many options available in hue, pattern, layout, etc., it is fundamental to creating a design where you will relax, barbecue and enjoy your time.Your patio is the basis of your outdoor room. Some design tips include thinking about coloring or texturing the patio to match your home’s existing architecture. You may also want to select natural, subtle colors to blend with the surrounding landscape. Size and layout also play an important role. You can incorporate curves and borders with concrete that can set off a boring patio into a beautiful quaint setting. With so many economical options with a concrete patio. The one thing everyone admires about colored concrete is that it transforms the bland, gray slab with which we are so familiar. 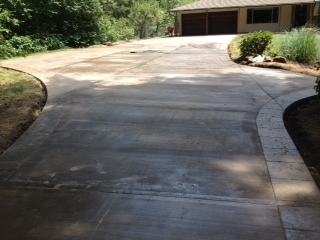 Using stains, freshly poured concrete can be colored easily and economically. In addition, your existing concrete walkway, driveway, interior floor or other plain gray slabs, can be stained just as easily allowing you to update and enrich your surrounding surfaces.